During the spring quarter, Richard taught a tango class. I'd taken it before, but never gotten to take it with a partner who I'd be able to come back to consistently. It's definitely a class that's good for that, and Erik was up for it. After a couple of nights of class, he said, "This is fun. 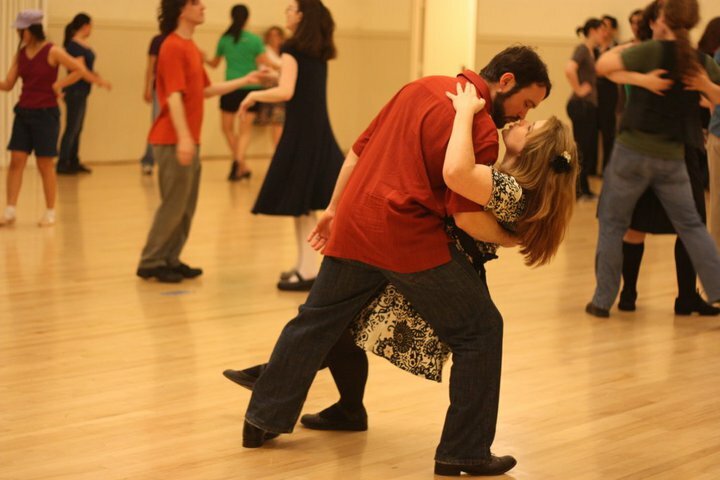 I like taking dance classes with you." It's such a simple thing to say, but I feel like I've waited my whole life to hear it. I've been dancing for 18 years now, and I've never had that before. It's magical. We did Waltz Weekend about ten days ago. Getting to spend a dozen hours with the same instructor over two days is a very different experience than a one-hour class or a series of one-hour classes. Richard adjusts with nimble precision to the skills and comprehension of the assembled group and allows time for both broad strokes and fine tuning. We went to the Gaskell Ball on Saturday night, and already the new moves were integrating into our dancing. Learning more together and being able to put that learning to use is a joy I've rarely experienced. Next up, we're trying to decide between Camp Swing and Down Home Blues. Meanwhile, we'll dance the night away at Friday Night Waltz like we are in the photo above. Thanks to David Bedno for once again capturing a great moment with his lens. I am think having a partner to practice with and develop small choreographies with is a wonderful thing. Both of you are very fortunate.